Although Gratis and Liza Boyd were the two to capture the 3'3" Young Hunter championship during Week 3 of the Winter Equestrian Festival, January 24-28, they had a true team behind them. 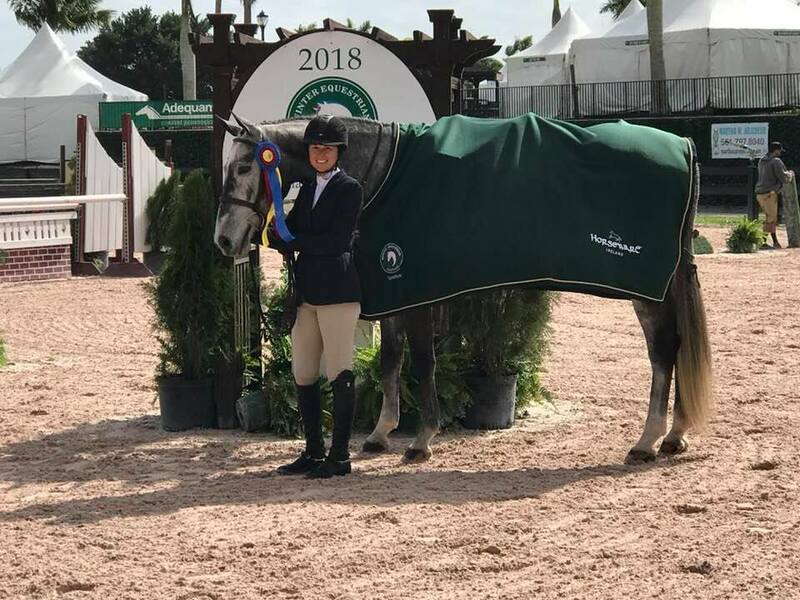 Owner Karen Lackinger's 6-year-old Hanoverian (Grey Top--Akazie) swept all four over fences classes and placed second under saddle for a convincing championship title. "I'm really proud of how far he’s come along. This time last year he’d never shown," said Liza. "We worked a lot at home last year, and he showed in the Baby Greens last spring before ending the year in the 3' Green Hunters." Liza noted that Gratis was a little scared about the Jumbotron in the adjacent ring at WEF, but she was careful in the schooling area to help calm his fears and reassure him. "I did have to change my plan in the schooling ring," she noted. "I didn't make it a big deal, though. Rather than walking him over to see it and face toward it, I bent him away from it when I was flatting. The more he looked at it, the more tense and nervous he would get." Instead, Liza decided to work to avoid the Jumbotron altogether and only jumped Gratis off the right lead, where he wouldn't have to face the moving screen. With that plan in place, Liza said he retained his focus and she was able to get some quality, round jumps in the schooling area that obviously translated well in the show ring, where he won every jumping class. "I've learned over the years it's best to distract them and keep them busy doing something else," she said of the green horses. "I like to change the subject, and if it wasn’t a moving object maybe I'd have a different strategy. But it's really unnatural for a horse to see what's basically a huge TV." Liza is also appreciative of having Gratis to bring up the levels. "Karen Lackinger lives in Aiken, South Carolina, and is a wonderful owner and supporter," noted Liza. "She bought Gratis herself and hopes to bring him along as a Derby horse, and he showed me a lot of a good characteristics of a derby horse here. For him to come through that challenge without a meltdown and go on and compete like he did showed his bravery. Gratis (and Katie Wood) on the trail! "He's also growing into his body, and I felt some jumps where he pushed well and is getting stronger behind. It's very exciting to start a horse from scratch to be a derby horse," she added. "I can't remember the last time I've had a horse just for me to produce. We've developed a bond, and he’s very trusting. And since I was the first one to ever show him, I know everything that’s happened and that he's done, so that’s fun!" Liza also credited Finally Farm Assistant Trainer Katie Wood for her integral role in preparing Gratis and the other horses this winter. "Katie is amazing behind the scenes," noted Liza. "With S&L Just A Cobbler, I have to work on fitness. 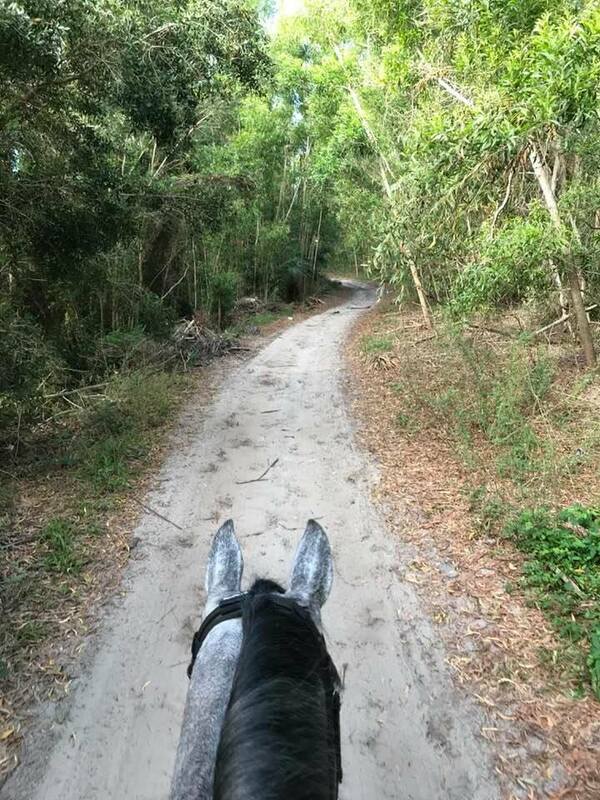 So she takes him on a four-mile trotting trail ride. I have no idea where she goes, but then she’ll say, 'I'm going to do a shorter trail ride, so I’ll do a nice walk.' She takes the horses out in the mornings and then brings them different ways home. "I'm seeing a big difference in my horses from all of the exposure they're getting to the different sights. If there's an issue, like a big flock of white birds, Katie never gets mad and makes everything a good experience for them. Clemens has been nervous about rain and walking over puddles (I lost a big class at Blowing Rock because of that), but she's been taking him out and encouraging him to go through water. She has a real talent for that natural type of horsemanship, and I’ve noticed it's helping me in the show ring. She keeps the horses happy, and she takes the kids out with her, so she's involving everyone. It's been fantastic!"